"happy b-day" vocals in fact means? May the essence of the First Nations Powwow rise again. Still a great classic even after about 21 years. Tracks like "Alcatraz" and "I Will Fight No More" are rare species that only few tracks can match and even fewer maintain this status after more than two decades. A lot of tracks made in 1992 sound horribly outdated today and have lost quite a deal of luster (If they are good, otherwise they sound a lot worser), The same cannot be said to these two tracks. It takes a lot of digging to find tracks made today that can equal this masterpiece of music. You may not even find any with all the dull crap produced today. A must in any electronic music collection 5/5. I rememeber hearing Alcatraz or Happy Birthday in my car driving to hamburg and back I rewinded the tape again and again because of the indian vibe and the trance elements it gave me so much energy and helped me to stay awake. Also in the club it was a real pusher. 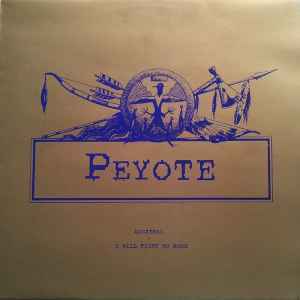 The B-Side I will fight no more forever was previously released on another record from Peyote and never reached the club status as Alcatraz. Thanks to RS for releasing this. Yeah, I agree with vinylserver. Beautyfull mysterious track and on the background you here 'happy birthday to ya'....this track was played every time we had birthday party back in the early nineties. 'I will fight no more forever' is a typical track that could hit right in the soul. It gives me the 'native/ritual' vibe on how whe should preserve our earth and be thankfull. Still gives back a lot of memories and melodramatic feeling. great release,but the track "Alcatraz" is not "Alcatraz"!!! the name of the track is "Happy Birthday",they took the wrong track from the master!!! if you listen to the track carefully,you can hear them singing "Happy Birthday"! Dj DAG,who produced that record,told me when it was released,that´s 100%!!! "Happy Birthday" is a really nice track,but believe me,"Alcatraz" is awesome,I heard it a couple of times from DAT,back in 1992!!! it´s a real shame that it was never released!